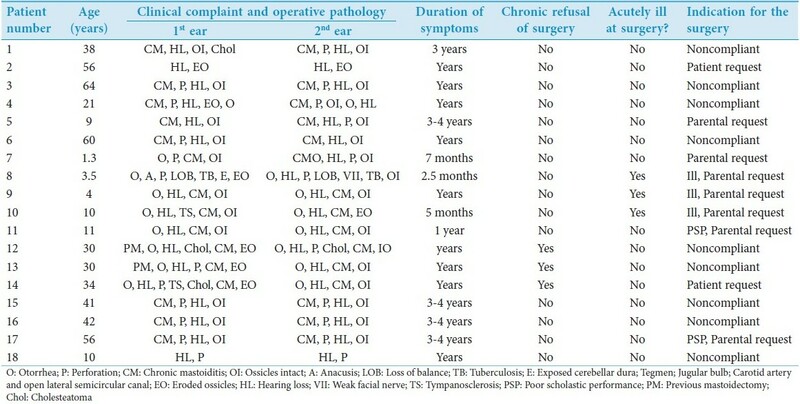 We reviewed the charts of the 18 patients who underwent bilateral mastoidectomies for chronic ear disease or cholesteatoma resection. These patients' preoperative evaluations, intraoperative findings, indications for simultaneous operation and postoperative courses were recorded. Preoperative and postoperative pure tone thresholds were calculated for the patients. The middle ear risk index was calculated from the history of previous surgery, otorrhea, middle ear granulation, middle ear effusion, tympanic membrane perforation, presence or absence of cholesteatoma, and status of the ossicular chain. Possible index scores range from 0 to 12; a low score suggests that the postoperative hearing outcome will be good, while a high score predicts a poor postoperative hearing outcome. Eighteen patients underwent simultaneous bilateral mastoidectomy. [Table 1] lists the patient's clinical evaluations, intraoperative findings and indications for simultaneous bilateral operation. [Table 2] and [Table 3] describe the first and second ears selected for operation, respectively. Of the 18 patients who underwent simultaneous bilateral mastoidectomies, seven of the patients were children. All of the adults and one of the seven children had chronic ear disease for many years. The most common indication for simultaneous bilateral surgery was noncompliance (50% of patients). The mothers of patients 11 and 17 insisted on the surgery to be done simultaneously because they attributed their children's scholastic problems to their ear disease, and all four ears showed improved hearing following surgery. Only three of the patients were acutely ill at the time of the surgery. Twenty-two ears had marked middle ear disease or mastoid disease. We selected the ear that would require the most attention to be operated on first. This technique allowed the surgeon to be most well rested while operating on the more difficult ear and also ensured the treatment of the more diseased ear should an interruption between ears be necessary. Patient 18 had minimal mastoid disease in his first ear and thus had only a tympanoplasty in the other ear. There were two intraoperative complications, both of which occurred during the first ear's operation. Patient 8's first ear was filled with white debris, with such erosion of bony structures that the cerebellar duras, the tegmen dura, the carotid artery and the jugular bulb were all exposed. In addition, the lateral semicircular canal was open and the stapes was loose in the oval window. The stapes was dislocated during surgery with minimal pressure and was immediately replaced on the oval window. In the contralateral ear, care was taken to avoid manipulation of the stapes, and dislocation did not occur. Postoperatively, the hearing in the first ear improved compared with preoperative levels. Patient 15 had a contracted mastoid in the first ear. As such, the second genu of the facial nerve was quite close to the tegmen as well as the roof of the aditus ad antrum. This area, already difficult to access and visualize, was also filled with cholesteatoma. The second genu was exposed, and the patient subsequently had a House-Brackmann Grade II/VI paresis of the facial nerve on that side. The second ear had identical anatomy, and cholesteatoma was seen within the narrow aditus. However, having just seen the contralateral anatomy with necessity careful dissection, the cholesteatoma was removed completely, with no facial nerve exposure did not occur. There were no intraoperative complications during surgery on the eighteen second ears. In [Table 2] and [Table 3], the higher middle ear risk index values tended to be associated with worse preoperative hearing. Only two of the 36 ears had noticeably worse hearing postoperatively. In the other ears, hearing was roughly the same or better postoperatively. Chronic otitis media in the context of Eustachian tube More Details dysfunction can be a clinical challenge. In our case series, most of the ears demonstrated extensive middle ear disease. Nearly all patients also had at least the same or better hearing postoperatively. Only two out of the 36 ears studied had worse hearing postoperatively. The average hearing improvement for all the ears was 11 dB. Despite this positive experience, the risk remains for undetected mistakes in each ear with the potential to deafen the patient bilaterally. Fear of such an outcome would be especially valid if the inner ear was intentionally entered bilaterally, as in the early days of bilateral stapedectomy. Nonetheless, the same fear is valid for mastoidectomy, an operation in which the inner ear is never entered intentionally. Performing simultaneous bilateral mastoidectomies is not comparable to performing simultaneous stapedectomies. Instead, it is more similar to operating on a diseased only-hearing ear, and requires the same level of vigilance. In chronic mastoiditis, without intervention, the ear is at risk of continued deterioration. Nevertheless, performance of a mastoidectomy on such an ear must be undertaken with careful consideration, and the patient must be fully versed in the risks. Similarly, when performing simultaneous bilateral mastoidectomies, the surgeon must draw on the specific patient's disease progression as well as intra-operative findings to determine the probability of the second ear becoming an only-hearing ear. If the first ear is extensively involved and difficult to eradicate of disease, then there is a greater likelihood that the inner ear will be injured. Subsequently, the surgeon must decide if the second ear's situation merits operation as an only- hearing ear. Finally, when performing simultaneous bilateral mastoidectomy, the surgeon is probably better prepared for the second ear with respect to individual anatomic variations than would otherwise be possible. We performed simultaneous bilateral mastoidectomies on eighteen patients with bilateral chronic ear disease. We selected the more challenging ear for the first operation. We had two intraoperative complications in the first ear among two patients. There were no intraoperative complications in the second ear for all patients. In 34 of the 36 operated ears, the hearing was the same or better postoperatively. We suggest that, after the first ear procedure, the surgeon makes three assessments. (1) What is the likelihood that the first ear is injured? (2) Is the diseased second ear extensive diseased enough to warrant surgery even if it is the only hearing ear? (3) Are the anatomical and pathological conditions of the first ear sufficiently unusual or difficult that it is safer, for the patient, to address the second ear while all the relationships are fresh in the surgeon's mind? 1. Smyth GD. Sensorineural hearing loss in chronic ear surgery. Ann Otol Rhinol Laryngol 1977;86:3-8. 2. Palva T, Karja J, Palva A. High-tone sensorineural losses following chronic ear surgery. Arch Otolaryngol 1973;98:176-8. 3. Tos M, Lau, Plate S. Sensorineural hearing loss following chronic ear surgery. Ann Otol Rhinol Laryngol 1984;94:403-9. 4. Proctor B. Chronic otitis media and mastoiditis. In: Shumrick PA, editor. Otolaryngology. 3 rd ed. Philadelphia: WB Saunders; 1991. p. 1349-76. 5. Klemens JJ, Mhoon E, Redleaf M. Is Simultaneous bilateral mastoidectomy ever advisable? J Laryngol Otol 2007;121:1041-7.